Flourless Chocolate & Pear Cake | Clare Cooks! Posted on December 23, 2011 by Clare Cooks! This cake is so easy to make. I was surprised it turned out so light. It really has a great texture, which is different than most other flourless cakes I’ve made. The cake is chocolatey without being overwhelmingly so. My pears sank a bit, but that did really matter to me. If you are more of a perfectionist when it comes to your desserts, make sure to whip the egg whites well to prevent sinking. I let mine sit a bit and had to re-whip them. If you need a quick, last minute dessert for a Christmas or Hanukkah dinner, you probably have most of these ingredients on hand already. The cake would be just as good with or without the pears, so don’t worry about them if you don’t have them.You could definitely substitute almonds for the hazelnuts or apples or even canned pears for the fresh pears depending on what you have on hand. 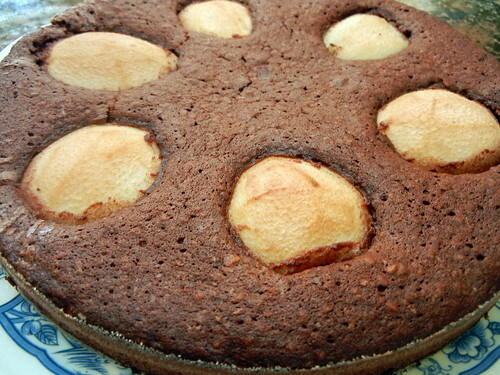 I would definitely use this recipe again with and without the pears for a simple and fast flourless cake. I only added powdered/confectioners sugar and freshly whipped cream for serving and it was perfect. Heat oven to 350F/180C/fan 160C/gas 4. Melt the chocolate and butter in a bowl over a pan of hot water, remove from the heat, stir in the brandy and leave to cool. Whisk the egg yolks with the sugar in a large bowl until pale and thick; fold into the chocolate with the hazelnuts.